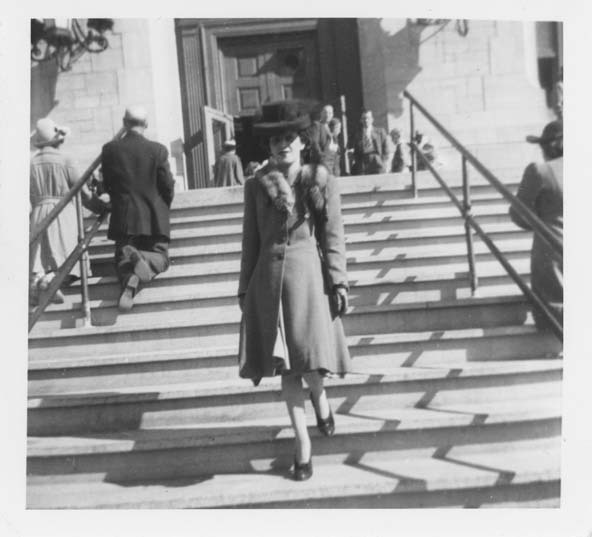 This is a black and white snapshot of Antoinette (Toni) Ciccarelli standing outside a public building on the front steps. Toni is staring straight at the camera with a slight smile on her face. Her face is partly in shadow because of her large black hat. She is wearing a knee-length coat with a fur stole, dark coloured shoes, and a pair of gloves. There are groups of people in the background coming in and out of the building.